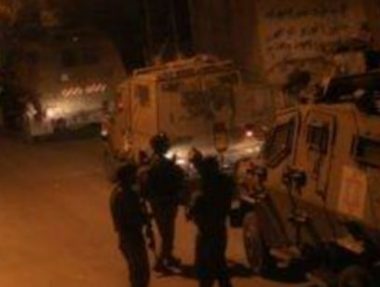 Israeli soldiers abducted, Saturday, a Palestinian man from the northern West Bank city of Jenin, after stopping him at a military roadblock near Bethlehem city, south of occupied East Jerusalem, and invaded many villages and towns near Jenin. The Bethlehem office of the Palestinian Prisoners’ Society (PPS) has reported that the soldiers installed a sudden military roadblock, south of the city, and abducted Mahmoud Mohammad Bushnaq, 46, from Rommana town, west of Jenin. Many army jeeps also invaded Jenin city, in addition to the villages and towns of Deir Ghazala, Ya’bad, ‘Aaba and Um at-Toot, and installed many roadblocks in various parts of Jenin governorate, before stopping and searching many cars.